Hoagie: I as clever as a hedgehog. Hiding in an Asteroid, surrounded by a Simulant Death Ship and a fleet of Annihilators with the only man who can save them being Arnold Judas Rimmer, is this the beginning of the end for the Dwarfers? The Beginning is not only the funniest and most dramatic episode of Red Dwarf yet, it is also the greatest character development episode. It begins like any other episode of Red Dwarf; a funny beginning looking at Rimmer youth goes to a short skit with Hoagie the android. Slowly, the episode creates more drama and before you know it we have more twists and turns than an episode of Blackadder. The revelations about Rimmer’s parentage plus the fact that the whole crew are face by a hoard of angry Annihilators has us on the edge of our seats wondering: How are they going to get out of this one? Luckily there is no quick exit, the resolution is brilliantly done and is not a cop out. However, the most excellent piece of story work is the fact that Rimmer finally destroys his fear of his father which has been plaguing him since the very first episode. We finally have the Rimmer back that we saw develop prior to the original Rimmer going off and becoming Ace Rimmer. No longer is Rimmer simply a cowering comic figure. He is a fully rounded human being with all the fault and good things that make us human. Chris Barrie is fantastic as Rimmer. After discovering that his father is not in fact his father but the gardener, Rimmer’s self-confidence is shattered. However, now realising that the man he thought was his Father no longer has any hold on him means that he can finally do what he always wanted to: be a military strategist. Throughout the scenes in Blue Midget, hiding from the Annihilators we see Barrie not doing comic acting (that is left to the rest of the cast) but more serious acting. The moment when Rimmer finally asserts himself is wonderfully played by Barrie, no longer is he downtrodden and spineless. From an acting point of view alone, The Beginning is far and away the best episode of the series yet. All in all, The Beginning does what is says on the tin. It’s funny, dramatic and all round wonderful. 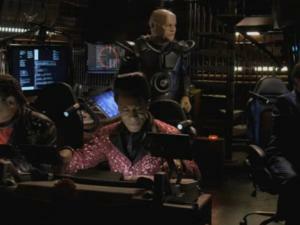 Hopefully The Beginning will be a bright new beginning for Red Dwarf.